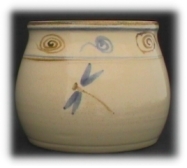 Our pottery adventure began in 1994 when Laura and I, spent a lot of our off duty time from work going to arts and crafts fairs. Laura was into stained glass, fused glass and drawing. I was into anything that could be made or shaped by hand, wood turning, glass blowing, candle making and most especially clay work. Every time I saw a potter at work, I would just stand and watch. Laura got so tired of hearing how I thought it would be fun and I would like to try it. I came in from work one day and she pointed to a news paper that was stuck to the refrigerator door. It was a full page ad about a pottery class that was being offered. My reply was rather off handed that it looked like fun. Laura said that she hoped so, that I started Monday. And that was how I started and where I met Bob Fazio, an Art Instructor and potter. 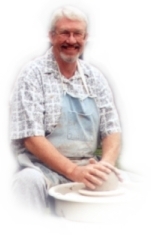 Bob had studied under Charles Counts, a world renowned potter and author. I truly fell in love with clay the first time I felt it slip through me fingers on the wheel. For the next 4 years it was a hobby and I made pots in our house. I bought a wheel and a used kiln. As retirement approached I began to wonder what next. I decided to take some more instruction and signed up to study with Stephen Jepson in Geneva Florida. After retirement,Laura and I decided to take our pottery on the road. We combined Laura's gift basket business and the pottery and became Something Southern Pottery. We signed up for some small Art and Craft shows and now do about 20 a year. We also have some gift shops and art galleries that carry our pottery. Please see our list of events and visit us when you are in the area. We use a stoneware clay fired to approximately 2200 degrees. Fred mixes all of our glazes and slips in the studio, and none of our glazes use any lead. All kitchen pots are food, dishwasher, oven and micro wave safe. We try to make a useful item and at the same time one that gives visual pleasure. We make decorative functional pottery for kitchen and household use. Enjoy our site and happy viewing and shopping!